This section provides a tutorial example on how to install Android platform libraries and tools using Android SDK Manager. 1. Double-click on "C:\local\android-sdk-windows\SDK Manager.exe" to run the Android SDK Manager. 5. Click the "Accept License" option, then "Install" button. 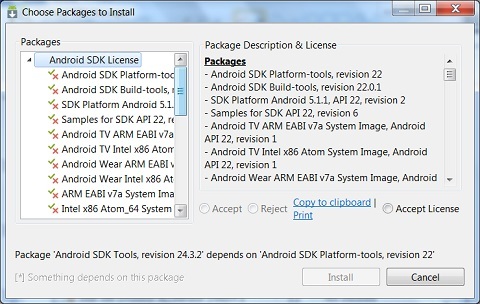 Android SDK Manager will start to download those selected packages.